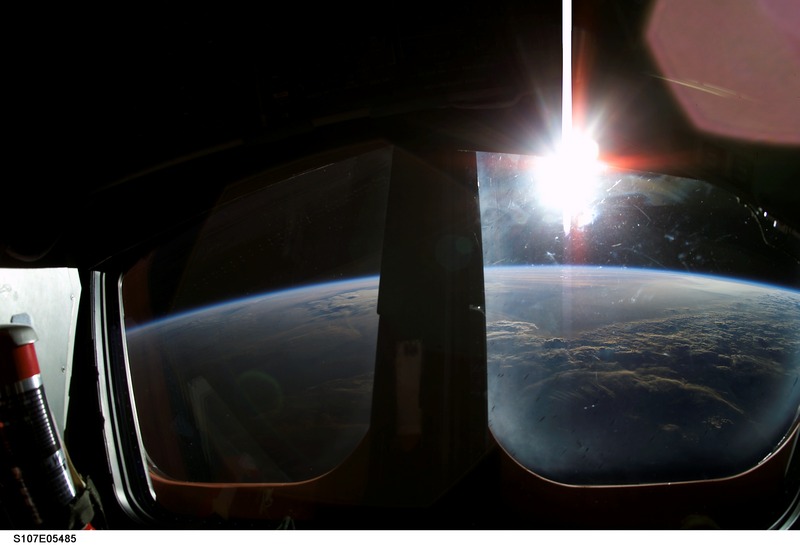 Images credit & copyright: NASA and the crew of STS-107 Columbia. “And for the whole time I was growing up, for as long as I can remember, any time anyone asked me what I wanted to be it was, “I want to be an astronaut.” – Commander Rick Husband. David M. Brown: Born, April 16, 1956: Son. Naval aviator, test pilot and flight surgeon; Brown worked on a number of scientific experiments and this was his first spaceflight. Rick D. Husband: Born, July 12, 1957: Son, father, husband. 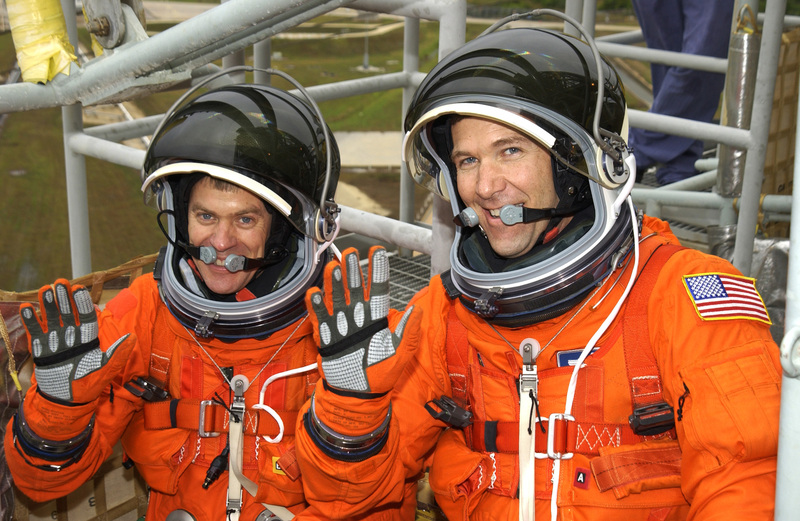 STS-107 commander, U.S. Air Force Colonel and mechanical engineer, who piloted a Discovery during the first docking with the International Space Station (STS-96). Laurel Blair Salton Clark: Born, March 10, 1961: Daughter, mother, wife. U.S. Navy captain and flight surgeon; Clark worked on a number of biological experiments and this was her first spaceflight. Kalpana Chawla: Born, March 17, 1962: Daughter, wife. Indian-born aerospace engineer and first Indian-American astronaut and this was her second spaceflight as she flew onboard Columbia during STS-87. Michael P. Anderson: Born, December 25, 1959: Son, father, husband. U.S. Air Force lieutenant colonel and physicist who was in charge of the science mission and this was his second spaceflight as he also flew on STS-89 which saw Endeavour venture to Mir space station. William C. McCool: Born, September 23, 1961: Son, father, husband. 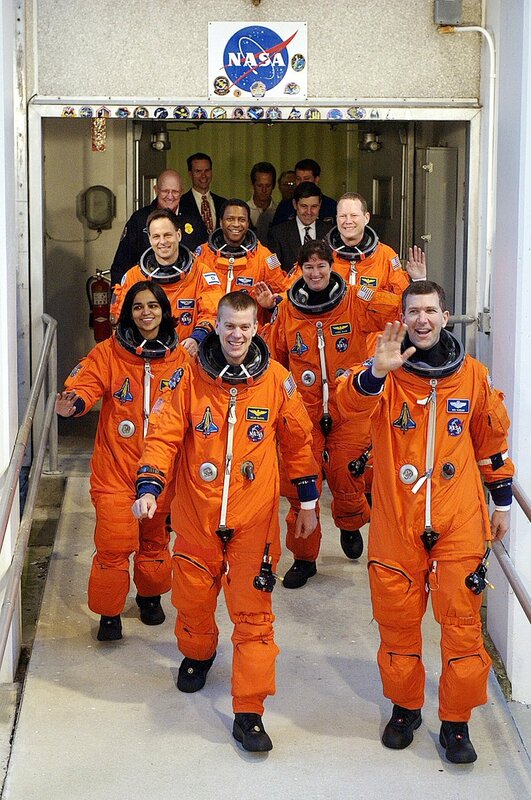 U.S. Navy commander, naval aviator, STS-107 mission pilot and this was his first spaceflight. Ilan Ramon: Born, June 20, 1954: Son, father, husband. Colonel in the Israeli Air Force, veteran of Operation Opera, the first Israeli astronaut and this was his first spaceflight. “This cause of exploration and discovery is not an option we choose; it is a desire written in the human heart. We are that part of creation which seeks to understand all creation. We find the best among us, send them forth into unmapped darkness, and pray they will return. They go in peace for all mankind, and all mankind is in their debt.” – George W. Bush February 4, 2003 at the STS-107 Memorial Service at the Lyndon B. Johnson Space Center, Houston TX. 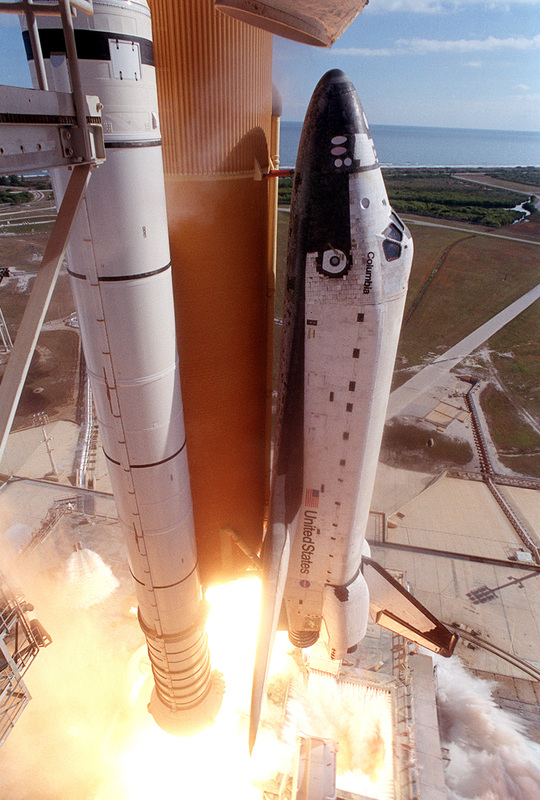 January 16, 2003; the 113th flight of the Space Shuttle program was to be OV-102’s 28th and final flight as Columbia launched into the Florida sky from Kennedy Space Center, Launch Complex 39A (LC-39A) as STS-107. The 16 day mission went as planned but it was unknown at the time , that Columbia had a massive hole in the leading edge of its left wing that it suffered during launch. A piece of orange external fuel tank foam broke free and struck the orbiter in flight. 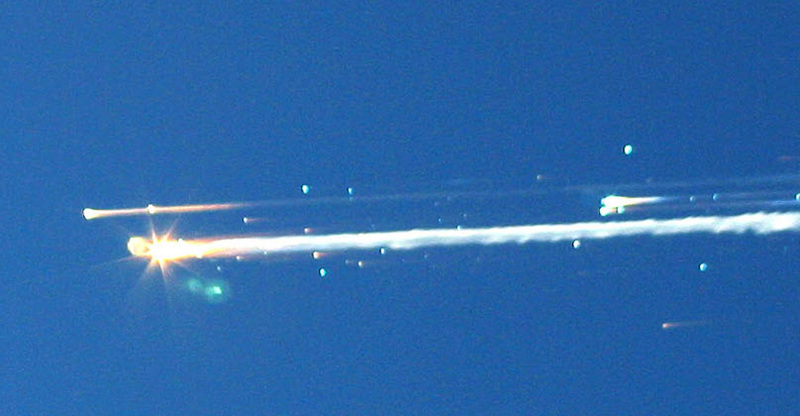 After reviewing the debris strike video, it was determined that it was unlikely that the event caused damage as this was a relatively common phenomenon. 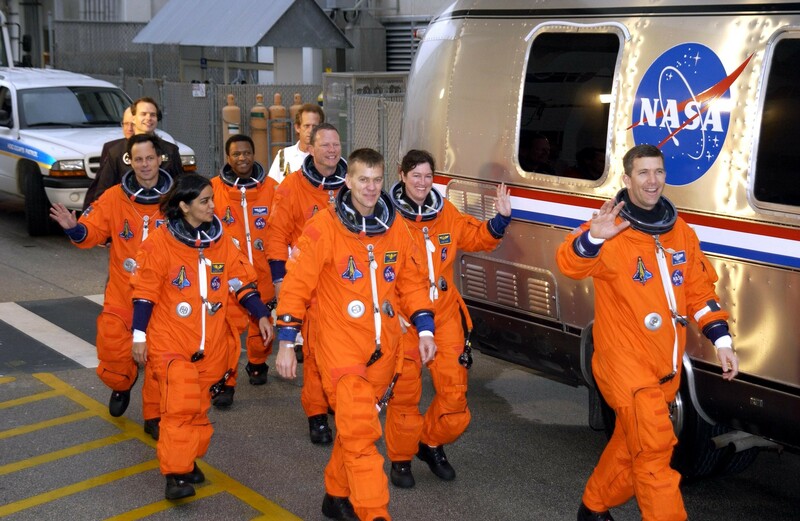 The STS-107 crew heads for the Astrovan and a ride to Launch Pad 39A for a simulated launch countdown. 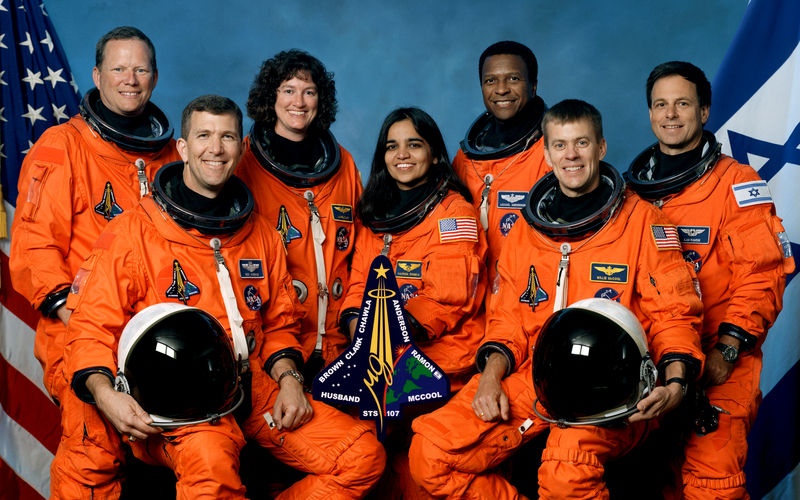 The crew of STS-107 Columbia. This and the following few images were recovered from the debris. 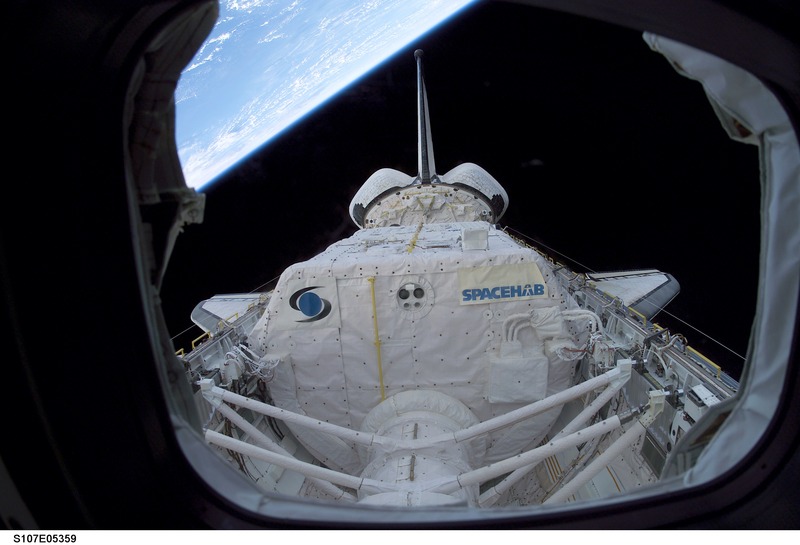 STS-107: View of Columbia’s payload bay with the SpaceHab experiment secured inside. The catastrophic damage to OV-102’s left wing was unfortunately just beyond view. 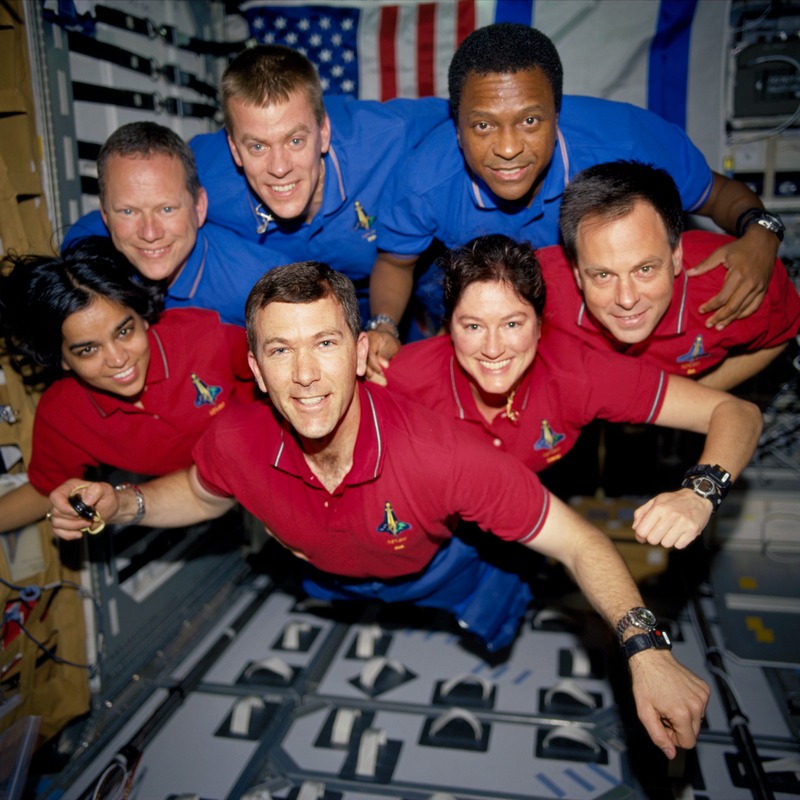 February 1, 2003 Space Shuttle Columbia (OV-102) and her crew of seven were in the process of re-entry having completed a successful 14 day mission (Columbia’s 28th mission) when at 08:54:24 EST the Mechanical Maintenance Arm and Crew System (MMACS) Officer alerted Flight Director, LeRoy Cain (FLIGHT) to the first signs of a problem in Columbia’s telemetry. Four hydraulic sensors in the Columbia’s left wing were reading “off scale low” meaning that for some reason the sensors had failed. Experienced witnesses in California and Nevada had already been seeing unusual anomalies as Columbia passed high overhead. For the next few minutes NASA Public Affairs Officer, James Hartsfield continued to narrate the situation as normal but it would soon be realized that there were major problems unfolding. Mission Control was in dialogue with Columbia as more and more sensor failures and abnormal readings came in. At 08:59:32 EST all communication and telemetry to Mission Control ended. Reentry and Landing CAPCOM for the flight, astronaut Charles Hobaugh “Scorch” repeated “Colombia, Houston. UHF Comm Check.” numerous times but when Columbia’s scheduled landing time came and went there was no doubt that Space Shuttle Columbia and her Crew of 7 astronauts had been lost. Witnesses viewed and recorded Columbia as many of the pieces streaked through the skies leaving a debris field through Texas, Louisiana and parts of Arkansas. To this day debris is still slowly being reported, recovered and added to the collection back at the storage location in the Vehicle Assembly Building (VAB) at Kennedy Space Center, Florida. Initial recovery of debris was placed in a reconstruction configuration at the Reusable Launch Vehicle Hangar located at the landing strip across the lot from where the shuttle Mate/De-Mate structure once stood. The Columbia Accident Investigation Board convened by NASA to determine the cause of the disaster came to the conclusion that at 82 seconds after launch a briefcase sized piece of foam that shed from the external fuel tank had struck the leading edge of the left wing, creating a hole. That hole, upon re-entry allowed the passage of super-heated gasses to enter Columbia, causing structural damage and ultimately a catastrophic failure of the machine. 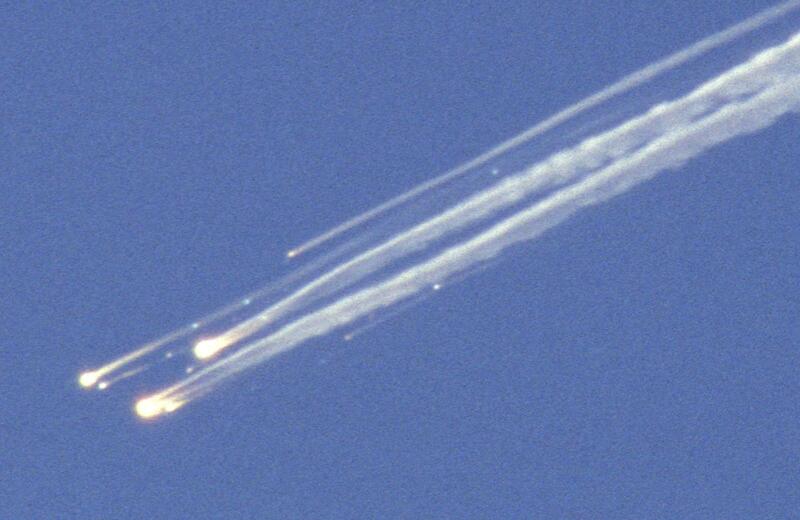 This “debris shedding” during launch was a well-known and an accepted aspect to shuttle flights. The piece that had broken free and struck Columbia was from the “left bipod foam ramp”. There had been several instances of this exact piece coming free in previous launches. Astronaut Dr. Sally Ride who also served on the Rogers Commission that investigated the Challenger accident noted striking similarities in the two disasters. “Since no machine is perfect, the problem comes down to identifying which known problems are an acceptable risk and which are not. In these two examples, shedding foam and failing O-rings, the organization failed to react correctly to the seriousness of the problem: in both cases, whereas engineers recognized the seriousness of the problem, NASA management dismissed both the evidence and the engineers’ expertise and ultimately decided to continue with the mission, with catastrophic results.” – Sally Ride. Richard Feynman, while serving on the Rogers Commission had submitted a personal addition to the appendix of the final report that is all too relevant to the Columbia Accident Investigation Board report. In it, he wrote: “It appears that there are enormous differences of opinion as to the probability of a failure with loss of vehicle and of human life. The estimates range from roughly 1 in 100 to 1 in 100,000. The higher figures come from the working engineers, and the very low figures from management. What are the causes and consequences of this lack of agreement? … we could properly ask, ‘What is the cause of management’s fantastic faith in the machinery?” – Richard Feynman. Space Shuttle Columbia (OV-102) was the first Space Shuttle to launch (STS-1) on April 12, 1981 and had completed 27 successful missions previous to STS-107. It was named for the Boston, Massachusetts based sloop captained by American Robert Gray. On May 11, 1792, Gray and his crew maneuvered Columbia past the dangerous sandbar at the mouth of a river that extends more than 1,000 miles through what is today Southeastern British Columbia, Canada, and the Washington-Oregon border. The river was later named after the ship. On a more direct patriotic note, “Columbia” is considered to be the feminine personification of the United States. The name is derived from that of another famous explorer, Christopher Columbus. OV-102 Columbia was also the only orbiter with no external air lock so even had the crew known of the situation they could not have mated to the International Space Station (ISS) for safety. Even as the Shuttle program came to a close in 2011, small advances had been made in “on-mission” tile repair but there was still no way to fix a leading wing Reinforced Carbon-Carbon (RCC) section. Had the exact problem happened again to another orbiter they would have to await rescue in the ISS for there was no fix possible. Today, the crew of STS-107 Columbia is honored on Mars in Gusev Crater as the landing base for Mars Exploration Rover 2 (MER-2 or MER-A) Spirit was renamed Columbia Memorial Station. Spirit also carries a circular plaque on the reverse side of its high-gain antenna with the STS-107 mission patch and the names of the crew on it. In the distance, Spirit has a view of Columbia Hills; a ridgeline of seven hills aptly named for the crew as well. 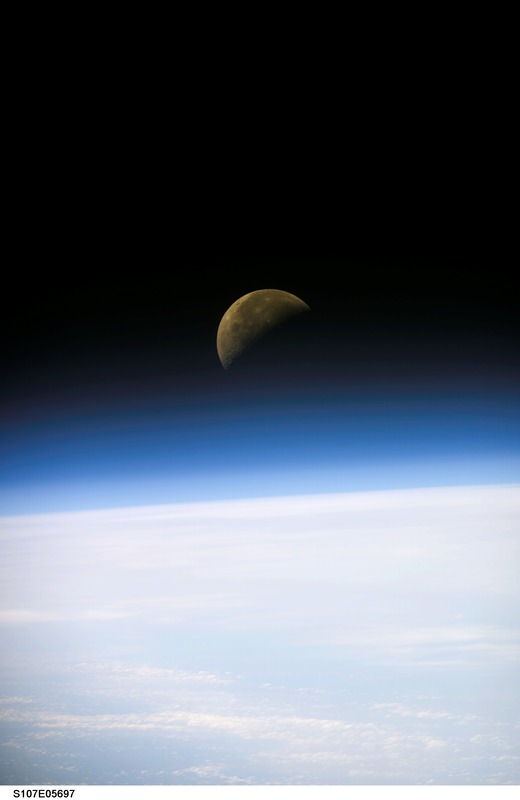 “Mankind is led into the darkness beyond our world by the inspiration of discovery and the longing to understand. Our journey into space will go on. In the skies today we saw destruction and tragedy. Yet farther than we can see, there is comfort and hope. 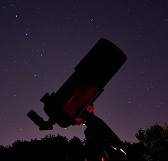 In the words of the prophet Isaiah, “lift your eyes and look to the heavens. Who created all these? He who brings out the starry hosts one by one and calls them each by name.” Because of His great power, and mighty strength, not one of them is missing. The same Creator who names the stars also knows the names of the seven souls we mourn today. 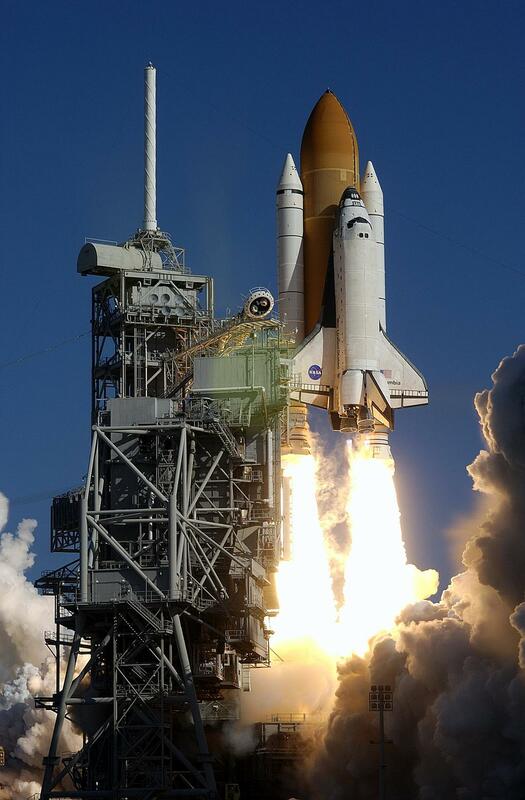 The crew of the shuttle Columbia did not return safely to earth, yet we can pray that all are safely home. May God bless the grieving families. And may God continue to bless America.” – President George W. Bush Feb 1, 3003 from the White House Cabinet Room. 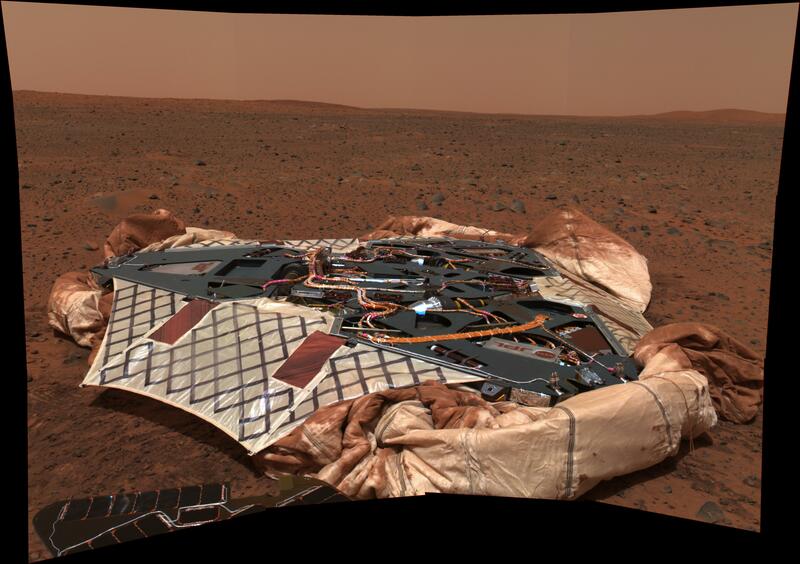 Columbia Memorial Station on Mars: Landing sire for MER-2 (MER-A) Spirit at Gusev Crater. 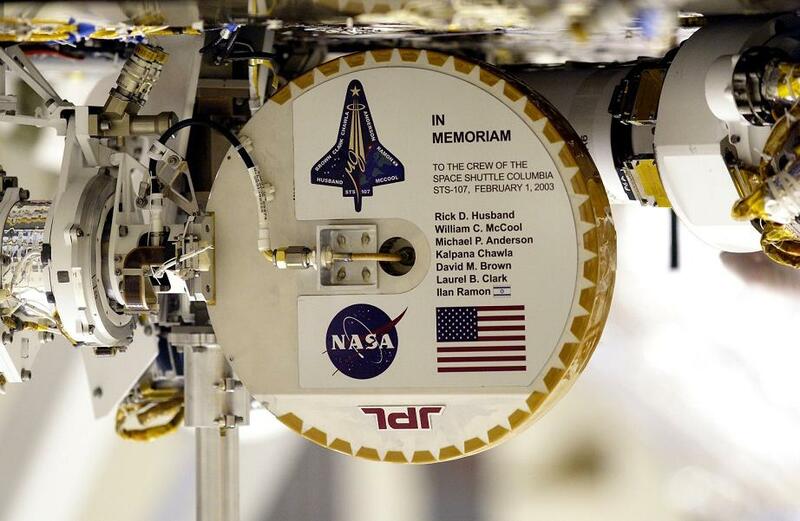 Plaque on the back of Spirit’s high-gain antenna commemorating the crew of STS-107 Columbia. 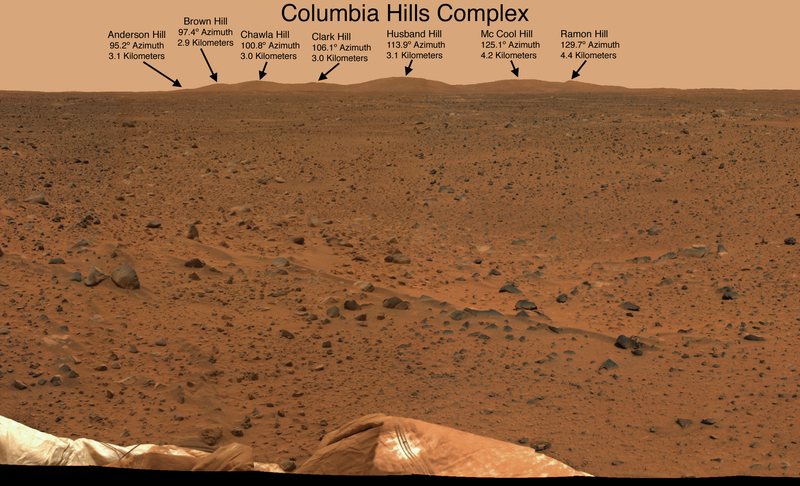 Columbia Hills Complex on Mars as seen by MER-2 (MER-A) Spirit. Image | This entry was posted in Images, Launches, News, People, Spaceflight Companies & Vehicles and tagged Columbia, DanSpace77, David Brown, Ilan Ramon, Kalpana Chawla, Kennedy Space Center, KSC, Michael Anderson, NASA, Rick Husband, Space Shuttle, Space Shuttle Columbia, STS 107, STS-107 Columbia, STS107, Willie McCool. Bookmark the permalink.